Click here for audio of Episode 1476. Today, the birth of the dishwasher. The University of Houston's College of Engineering presents this series about the machines that make our civilization run, and the people whose ingenuity created them. We've spoken before of John Fitch, the star-crossed steamboat inventor who ran a steamboat service between Philadelphia and Trenton, seventeen years before Fulton's boat. Fitch's early marriage had turned into a disaster, and Fitch had fled from it. But he left an infant son, Shaler Fitch. Shaler begat Irene Fitch, who married civil engineer John Garis. Garis helped to build the city that was old Chicago -- before the great fire. So their daughter Josephine, born in 1839, came from a strong creative lineage. She married a merchant and politician named William Cochran and tried to live the uptown life of a wealthy socialite in Shelby county, Illinois. She didn't share her husband's populist thinking. When she spelled her married name, Josephine Cochrane fancied it up by adding an e on the end. Writer J. M. Fenster tells how, when she was 44, Josephine found that her fine china tableware was chipping. It'd been in the family since the 17th century, and the servants were being careless with it. So she took to washing her own dishes and chafed at the indignity of it. There had to be a better way around the servants. She sat down with a cup in her hand, thinking. Water jets offered the best means for cleaning it. The trick would be to aim jets on china held firmly in some sort of rack. She and her husband, who was ailing, had been scheduled to go off for a rest cure, but now she had a cause. She stayed home to work out a design. Husband William was soon home, feeling even worse. Two weeks later, he died, and Josephine was left with a scant fifteen hundred dollars and much more than that in debts. She'd also lost the influence he would've provided in pushing her invention. At that moment, everything changed. Josephine Cochrane became the driven developer and champion of a wholly new commercial venture. She started out in a shed behind her house. Four years later, she was advertising the Garis-Cochran Dish-Washing Machine Company in periodicals. She later said that the hardest part of the task was not turning from a socialite into a mechanic, but turning from a socialite into the promoter of a new product. Cochrane's big break came when the 1893 Columbian Exposition used her new machines in its vast kitchens. The company kept growing, propelled by her dogged energy, until she died of nervous exhaustion at the age of 74. Late in life, she'd said, "If I knew all I know today [I] never would have had the courage to start." After she died, the company changed hands and names until in 1940 it became the Kitchen Aid part of the Whirlpool Corporation. Cochrane's success makes a nice counterpoint to her great-grandfather. John Fitch churned the waters of an earlier America with his steamboat. He failed on the business side, where she at last succeeded. But both were inspired amateurs. Both set the stage for the kind of lives you and I live here in America today. Fenster, J. M., The Woman Who Invented the Dishwasher. Invention & Technology, Fall 1999, pp. 54-61. See also the article on John Fitch in the Dictionary of National Biography. Before Cochrane, others had built dishwashers that operated on much less efficient principles. 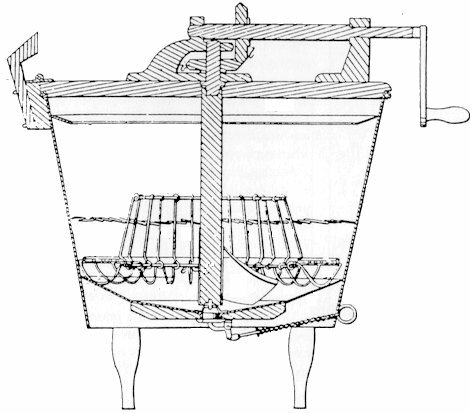 L.A. Alexander's 1865 patent drawing below showed a device that used a hand crank and gearing to spin a rack of dishes through the dishwater. The washing effect is far less in such a device.